Into the old woodshed that connects the barn to the house and you're overwhelmed by the collection of early working duck decoys and the extensive collection of the work of East Harwich's A. Elmer Crowell. 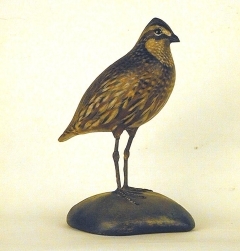 Cherished by decoy collector's for decades, A. Elmer Crowell's work is now considered a true form of Cape Cod folk art. 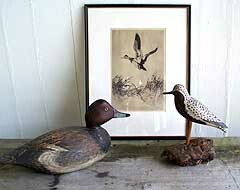 A collection of waterfowl etchings by Frank W. Benson hang on the walls.